When I found out that Mammoth Mountain Ski Resort had recently opened their bike park to the e-bike masses, my jaw dropped. “This is the tipping point,” I thought. 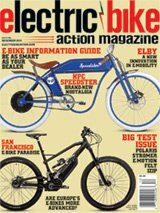 “This changes everything!” It’s a huge thing, not just for e-mountain bikes in the U.S. but for e-bikes in general here. Do you remember what happened when snowboards first appeared? Skiers and ski resorts didn’t want those hooligans on their slopes. No way! “They’ll tear everything up!” they cried. Snowboarding was relegated to backcountry hills until skiing took a little dip and a couple of resorts realized that “hooligans’” money was better than no money. After that, the industry took off, and the manufacturers and resorts all saw massive growth. Snowboarding may very well have saved the ski resorts. It’s such a parallel to what is going on with electric bikes. Though Europe has embraced them and sales are huge there, here in the U.S., e-bike growth has been steady. But, in my estimation, it hasn’t taken off yet. Why? Partly because most people in the States still don’t even know they exist. Introducing them to the bike parks and trails opens up people falling in love with e-bikes. It’s a win-win all the way around! Another thing that has hampered sales of e-bikes is the attitude of traditional cyclists who pooh-pooh the bikes as something for people too weak to ride a traditional bike. I bet most of those who have that attitude have never thrown a leg over an electric bike. It only takes a couple of pedals on one before the light bulb in their brains goes on, and they suddenly see the potential and the fun of e-bikes. There’s a place for both, and the flagging sales in the non-assist bikes can only be helped by getting more people on two wheels. It’s not only coming, it’s here—just look at all the big-name bike companies who have e-bikes now. .com) and pick up groceries. On a more competitive level, which I think could also help bolster e-bike popularity, two new race series were announced at the Sea Otter—the Troy Lee Designs/Bosch Boogaloo and the indoor Endurocross series—both of which are comprised of four races each. There are many ways to get people excited about e-bikes, and what better way than watching some bar-to-bar, elbow-banging? An e-bike can be a fun way to get in a longer ride before sunset, ride much farther on a given day or just give you a great reason to try a trail or path you never would have before because you weren’t sure if it would be worth it. Another big thing in U.S. e-bike news is that New York City finally sees the value in electric bikes as one of the best forms of transportation around the city. We recently experienced the same thing (see EBA, February 2018) that turned New Yorkers off to the bikes, but it wasn’t the bikes at fault; it was the fault of the restaurants for not training their delivery workers about the NYC street laws, as most of the delivery workers are from foreign countries and are unfamiliar with the way traffic works here. In some countries, traffic laws are treated as suggestions. In NYC, that can get someone injured or killed. Albany hasn’t decided to jump on the bandwagon and adopt the now nearly standard laws (with the three classes) as other cities have, but with lobbying by groups like PeopleForBikes, companies like Bosch and business owners like Chris Nolte from Propel in Brooklyn, I hope that it will change soon. Groundbreaking legislation and rule changes show these people as true leaders, and they’ll be remembered in history as the visionaries who helped shape a better, brighter tomorrow. Stay tuned, and get out and ride!